Oatmeal is delicious and healthy at the same time. Aside from the usual oatmeal with fruits and milk, it can also be cooked in different ways. 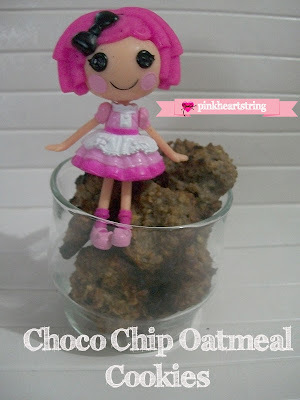 I am going to share to you a simple oatmeal recipe. This is actually experimental but it turned out well and delicious. 1. I used instant oatmeal because that was the only one available but you can also use cooking oats. I place hot water to the oatmeal first to be sure it will me cooked. lol. But I only placed a small amount. 3. On a bowl, I placed one egg and beat it. I added sugar and butter afterwards. 4. Then I added the oatmeal and choco chips. I stirred them until well blended. 5. I placed butter on the pan and then dropped tablespoonsful of the mixture forming round cookies. 6. I baked it for around 10 minutes. And then they are done. Mini-Lalaloopsy Crumbs Sugar Cookie then came for the picture taking. sounds good and simple to make! 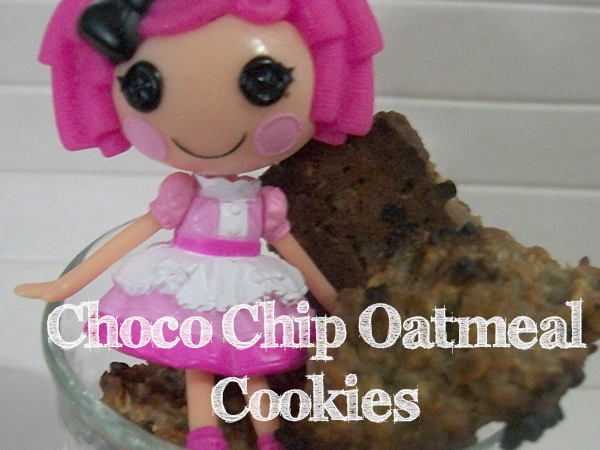 I love oatmeal cookies, but I don't think I've tried them with chocolate chips. Thanks! YUM YUM YUM. I bet my kids would love these. I know I would. Love this! Thanks for posting!!! And great blog hop, too!!! Thanks! I love oatmeal & chocolate chips, so this combination looks delicious to me! i love eating biscuits/cookies and has since gone on a clean carbs diet so this oatmeal cookie is just perfect for me! but are they the soft cookie type of crunchy type? and what are the measurements of the ingredients?